Giampaolo Bandini is considered to be one of the best Italian guitarists on the international music circuit. In 2003, he was nominated as the best Italian guitarist of the year by the magazine Guitart’s readers. He graduated with distinction at the age of 19 and owes his musical education to Maestro Giovanni Puddu. As far as the chamber music field is concerned, he studied at the prestigious Piano Academy of Imola with musicians such as Pier Narciso Masi, Alexander Lonquich, Dario De Rosa, Maureen Jones and Franco Gulli, earning a Master Diploma as best chamber music ensemble. Giampaolo Bandini was a member of the only guitar duo that succeeded in appearing in the roll of honour in the most prestigious national and international chamber music competitions such as the 11th “Città di Caltanissetta” Competition (member of the International Competition Federation of Geneva) in 1995, Perugia Classico, “Città di Gubbio” Prize, “F.Cilea” Città di Palmi Competition, Selezione A.R.A.M.-Roma, Selezione Nazionale Gioventù Musicale d’Italia, winning the first prize on each occasion. Since 1990, he has featured in the most important concert institutions in Italy and abroad (Carnegie Hall of New York, Musikhalle of Hamburg, International Centre for the Performing Arts of Peking, Ravello Festival, Teatro Regio of Parma, IRCAM of Paris, Chopin Museum of Warsaw, Accademia di Santa Cecilia and Parco della Musica in Rome, Unione Musicale of Turin, Amici della Musica of Florence, Palermo, Pistoia, Festival Verdi, etc.) as a soloist and as part of different chamber music ensembles. In November 2002, he made his debut in the Grand Hall of the prestigious St. Petersburg Academic Philarmonic, an honour which is rarely granted to a guitarist, achieving such great success that he was asked to play for the following five years. He regularly features as a soloist, in chamber music ensembles and with orchestras in the most important music Festivals around the world, from Europe to the United States, from Africa to South America (Mexico, France, Croatia, Germany, USA, Slovenia, Switzerland, Hungary, the Czech Republic, Poland, Russia, Austria, Serbia and Montenegro, Libya, Holland, Romania, Spain, Moldova, Slovakia, England, China, Belgium, Turkey and Bosnia). 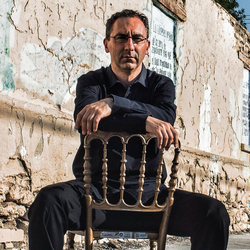 He collaborates with prominent musicians such as Massimo Quarta, Danilo Rossi, Enrico Bronzi, Pavel Berman, Francesco Manara, Moscow Virtuosi, Corrado Giuffredi, Quartetto d’archi della Scala, Trio di Parma, I Virtuosi Italiani, Andrea Griminelli, Michele Pertusi, Massimo Mercelli, Simonide Braconi, Enrico Fagone and with artists such as Arnoldo Foà, Nando Gazzolo, Elio (delle Storie Tese), Amanda Sandrelli and many others. Recently, he had the privilege to perform Leo Brouwer’s “Concerto Elegiaco” for guitar and orchestra, conducted by the composer himself, during the Concert Season of the Teatro Regio of Parma. He has been studying with enthusiasm praxis of the nineteenth-century’s performing on period instruments, collaborating and playing with the major expert in this field: the Czech guitarist Pavel Steidl. As a teacher, he is requested by the most renowned Academies and Institutions such as Chopin Academy of Warsaw, Rimskij Korsakov Conservatory of St. Petersburg, Arts Academy of Rome. He holds courses and masterclasses throughout Europe. At present, he’s a guitar and chamber music teacher at the Music Academy of Teatro Cinghio in Parma, at the Music Institutes of Higher Education “L. Boccherini” in Lucca and “R.Franci” in Siena. He holds summer classes at the Festivals of Portogruaro and Gubbio. Giampaolo Bandini has recorded more than 10 Cds for record companies such as Stradivarius, Nuova Era, Niccolò, Fonit Cetra, Tactus, Clair de lune, Quadrivium “Le Vele”, etc. On the occasion of Verdi’s Centenary (2001), he recorded, for the first time ever in the world, J.K.Mertz’s Fantasies based on Verdi’s Operas meeting outstanding critical approvals. He has recorded for the most important radio and television broadcasters in Italy and abroad (RAI 3, RTSI, Radio Tre, Radiocapodistria, etc.). His interest in contemporary music leads him to collaborate with famous composers and execute several music works at the first attempt. Artistically relevant to his education has been his close relationship with Maestro Camillo Togni . Bandini was his first performer of “In Alter Zeit” and executant of his complete works for guitar solo. Recently, he had the pleasure to be invited by Sylvano Bussotti to play “Rara eco sierologico”, a guitar composition written by Bussotti himself, during the concert held to celebrate his 75th birthday. In 2004, he was awarded the 15th “Beniamino Joppolo” Città di Patti Prize (in the province of Messina) for remarkable achievements in the field of music. He plays a guitar that the luthier Maestro Antonino Scandurra expressly made for him.